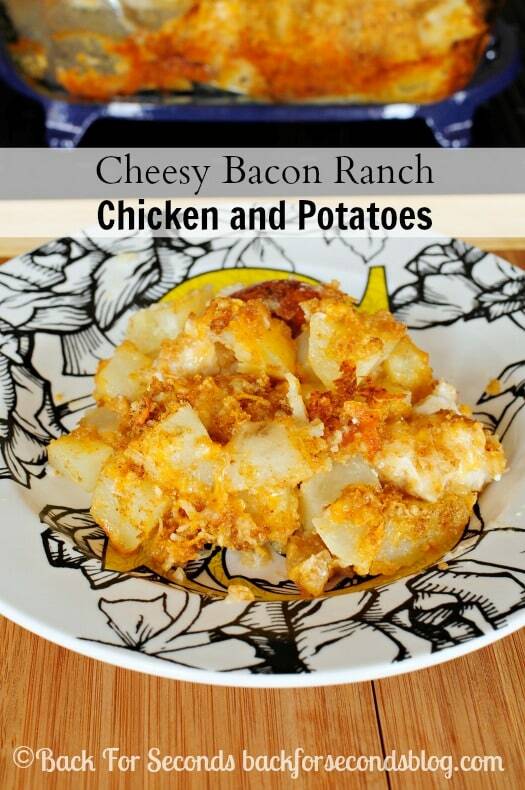 Cheesy Bacon Ranch Chicken and Potatoes is a delicious meal that comes together quickly and easily. 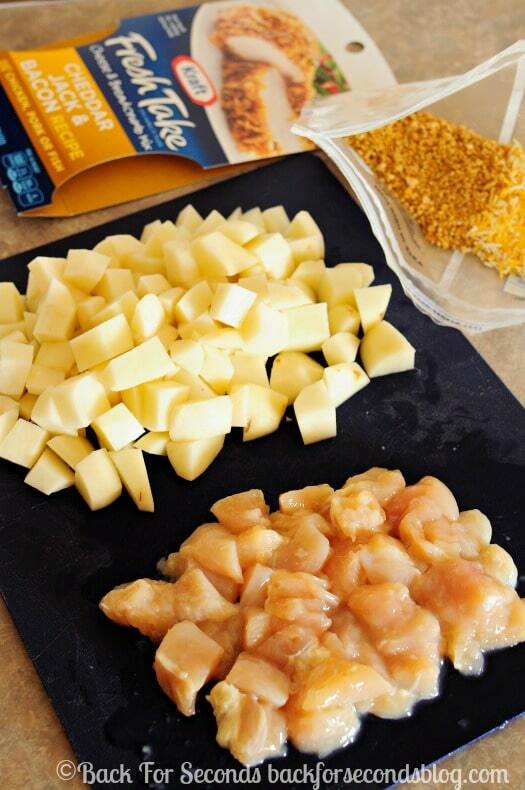 Thanks to Kraft for sponsoring this Fresh Take recipe and post! I cannot tell you how much I love quick and easy one dish meals! 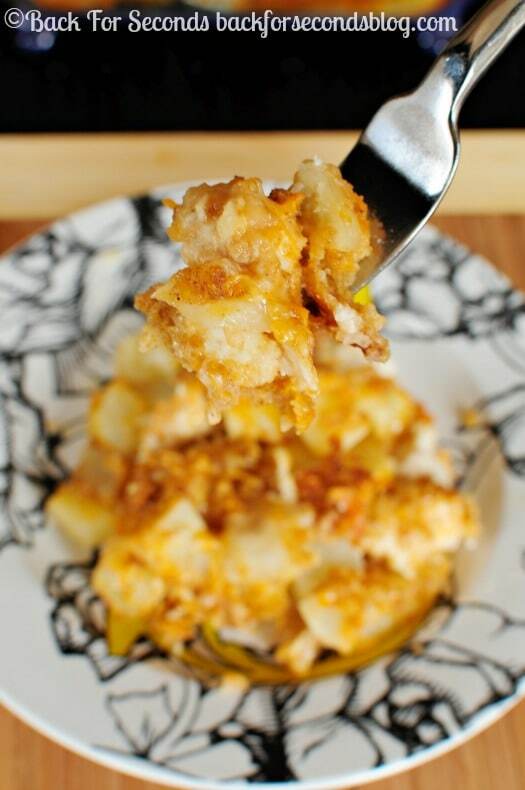 This Cheesy Bacon Ranch Chicken and Potato Bake is one of them! It is packed full of delicious flavors and it takes just minutes to put together! This is the kind of meal that is not only great for everyday dinners at home, but it’s wonderful for gatherings with friends and family! Meals like this come together so quickly, you can spend your time with your loved ones and not be stuck in the kitchen all day. In our family, whenever we get together for a meal, we all bring a dish to share. This dish would be a big hit for sure, I mean, it’s got bacon and cheese! What’s not to love? I went to Walmart to take advantage of a little meal prep help. These Kraft Fresh Takes are so great because all the work is done for you – no greasing up my kitchen frying bacon for this dish. Gotta love that 🙂 Right now you can get a coupon for $1 off chicken when you buy a package of Kraft Fresh Take! I bought the Cheddar Jack and Bacon Fresh Take and came home to put it to work! Peel and chop some potatoes, chop up some chicken and mix them together with some ranch dressing. Put it all in a baking dish and sprinkle with the Fresh Take packet. That’s it! So easy, and super tasty! The cheese, bacon, breadcrumb mixture makes a nice crust over the chicken and potatoes – that’s the best part 🙂 Add your favorite veggie and you have a fantastic meal your whole family will enjoy! 4 ingredients!! You can’t beat this. Simple is ALWAYS best! Thanks for this lovely recipe!! Oh heck yeah. 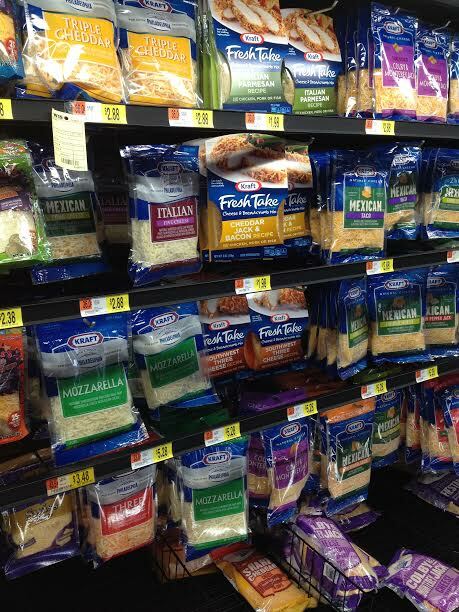 Look at all that cheesy goodness. This is fabulous. How have I not see these in the store??? I love what you did with them. One-dish meals are awesome. Cheese, bacon and potato….what’s not to love? 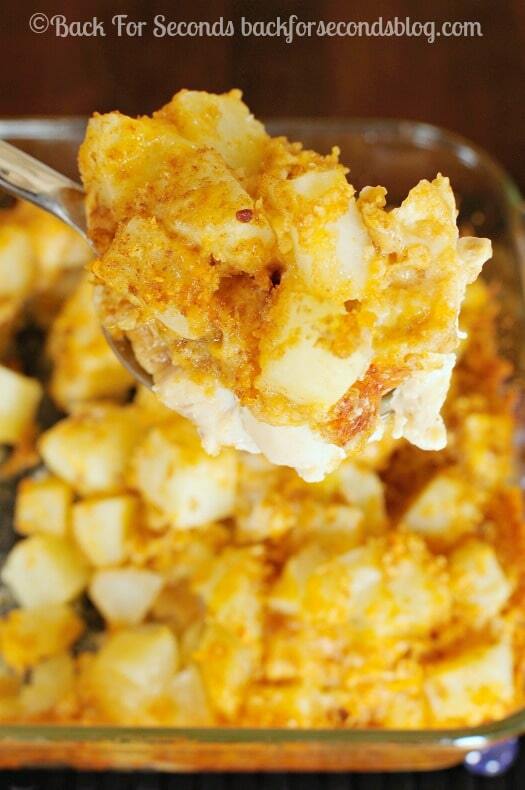 You can’t ever go wrong with cheesy potatoes. Like ever. I’ve never seen the Fresh Takes before. I’m with Paula, never can go wrong with cheesy potatoes-so good!!! These Kraft Fresh Takes. I have never heard of them. I am in Canada. Do you know if they are available here? If not, then could a person use Shake and Bake and add cheese and bacon? If so, how much would a person need? Hi Nancy! I am not sure if they are available in Canada…You could definitely use Shake and Bake instead. I would add 1 1/2 cups cheese and maybe 6 slices of chopped, cooked bacon. Enjoy!